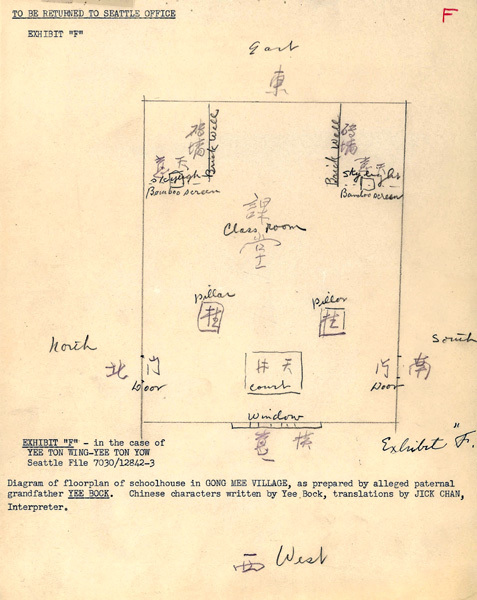 “Floor plan for Schoolhouse in China, Exhibit F” 1939, Chinese Exclusion Act case files, RG 85, National Archives-Seattle, Yee Ton Wing case file, Seattle Box 805,file 7030/12842. This file contains nine floor plans for the schoolhouse and family home in Gong Mee Village, China and an affidavit with photos of Yee Ton Wing and his father, Yee Gim Cheow. Yee Ton Wing was coming to live with his father in Cuyahoga Falls, Ohio. Yee Ton Wing was 16 years old when he arrived in the Port of Seattle with his 12- year old brother, Yee Ton Yow, on 2 February 1940. They were students joining their father in Ohio. The transcript of Yee Ton Wing’s first interrogation was nine single-spaced typed pages long. (Eventually there were almost fifty pages of questioning.) Most of the inquiry pertained to his extended family and their village. He correctly identified photographs of his alleged father, grandfather, and uncles. He was asked things like: Where does your mother keep the rice that she cooked for your family? Who lives in the house on the first lot in the 4th row in your village? What are that person’s occupation, age, and the names of his children? There were five diagrams of the floor plan of the schoolhouse in Gong Mee Village. They were made by the applicant, his younger brother, their grandfather, Yee Bock; their paternal uncle, Yee Gim Gin (Gane); and Yee Gim Cheow, a witness. The witness’ diagram looked considerably different than the other four. There were four diagrams of the floor plan of the 1st and 2nd floors of the family home. They were all in agreement. 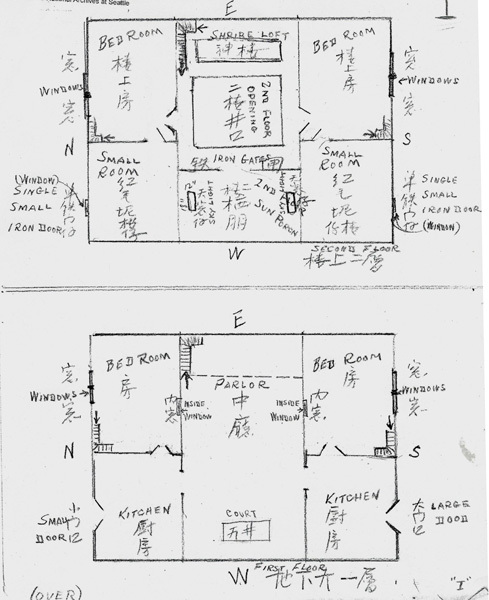 “Floor plan of family home in China, Exhibit I” 1939, Chinese Exclusion Act case files, RG 85, National Archives-Seattle, Yee Ton Wing case file, Seattle Box 805,file 7030/12842. Yee Ton Wing and his brother Yee Ton Yow were interrogated on 2, 4, 5, 6, and 7 March 1940 and finally admitted to the United States on 25 April 1940 as citizens and as the sons of Yee Gim Cheow, a citizen. The reference sheet in the file contains the file numbers, names, and relationships for Yee Ton Wing’s bother, grandfather, four uncles, aunt-in-law, cousin, and his mother.